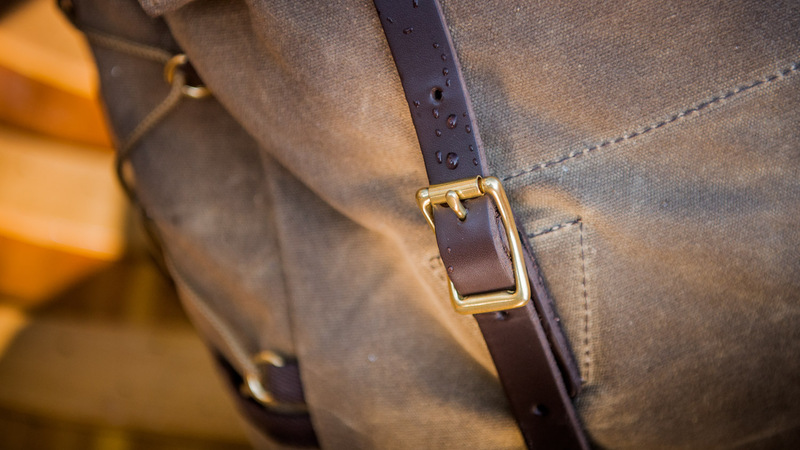 There’s a steadfast durability, a quiet confidence built into each one of our waxed canvas bags. It comes from using the highest quality raw materials and hardware, assembled with tried and true techniques and it’s part of what makes a Frost River pack special. Everything we make is built to last and be used outdoors: All our reliable softgoods are held to the standard of our canoe packs. Large, purpose built packs, specially designed and reinforced to handle heavy loads over the rugged terrain of the northern canoe country wilderness. No matter if you’re looking at a brief, tote, purse, bike bag, or piece of luggage, you’ll benefit from the traditional materials and handcrafted construction that have been refined over generations in our hometown, Duluth, Minnesota. WAXED CANVAS IS TOUGH, BUT LIKE ANYTHING WORTH HOLDING ONTO, IT NEEDS TO BE CARED FOR. Most importantly, it must be dried out before it’s stored. Mold and mildew love to take up residence in cotton fibers. It will also last longer and work better if it’s cleaned out from time to time. And while our waxed canvas is tougher and much more weather-resistant than untreated canvas, it is still cotton and therefore requires a little extra care to help it last and perform at its best. ONCE IN FROM THE FIELD, DRY OUT YOUR PACK! Empty it out. Grab it by the bottom, and shake all the stuff out. Keep it wide open or turn it inside out and let the interior dry and air out. Air-dry and inspect the leather reinforcements. You can condition the leather if you’d like, but the reinforcement leather is meant to be hard and more dry than heavily oiled. Never accelerate the drying process with leather. Never store a canvas bag when it’s wet. You can read more about storing your reliable softgoods, and info on leather care here. Waxed canvas bags are different than bags made from other materials, they’re not meant to be “washed”. They’ll develop a unique patina with age and use. Why would you want to wash off that good, hard-earned character? Some say that campfire soot, coffee stains, and other evidence of adventures all combine to make a waxed canvas pack better. Brush the big chunks off with a soft scrub brush or old tooth brush. Add some plain water and use the brush for stubborn spots. Add pressure if necessary. Consider a garden hose, or spray bottle on “stream” (be sure there’s no cleaner or chemical residue in the bottle, especially bleach). Use a bit of mild bar or flake soap, but not detergent, to spot clean. Note: Using soap and intense cleaning may require you to add wax once you’ve finished cleaning. Never put a Frost River bag in the washing machine! It, and likely the machine, will never be the same. 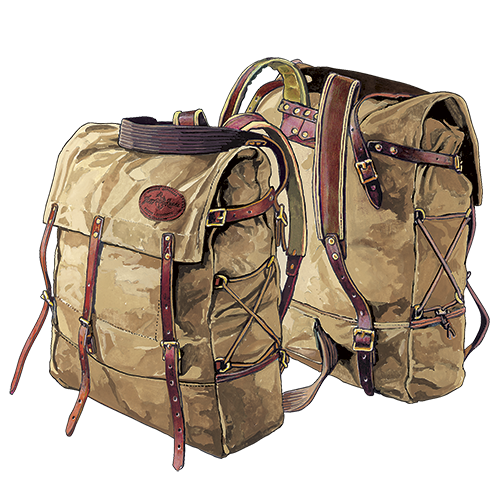 A little care and upkeep will go a long way toward keeping your pack or bag in good shape. Some time invested early in repairs, cleaning and quality storage will keep your reliable softgoods working for you for years to come. Now raise a glass (or a can) to American Manufacturing and a job well-done keeping your gear in good shape! We pride ourselves on crafting rugged canoe packs, our big backpacks for carrying a camping kit from lake to lake in canoe country. Everything we make is built to those same standards. 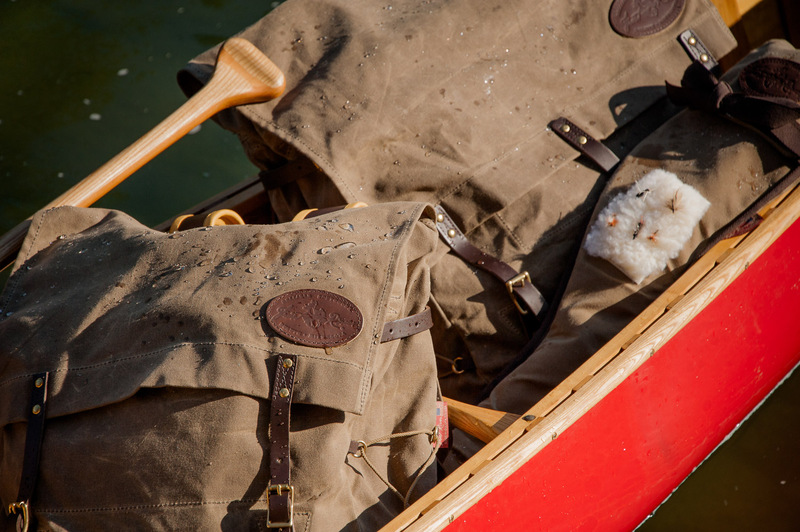 There’s unique character built into your bag, and with a little care, your waxed canvas and leather partner can be at your side, on your back, and in your canoe for years to come. 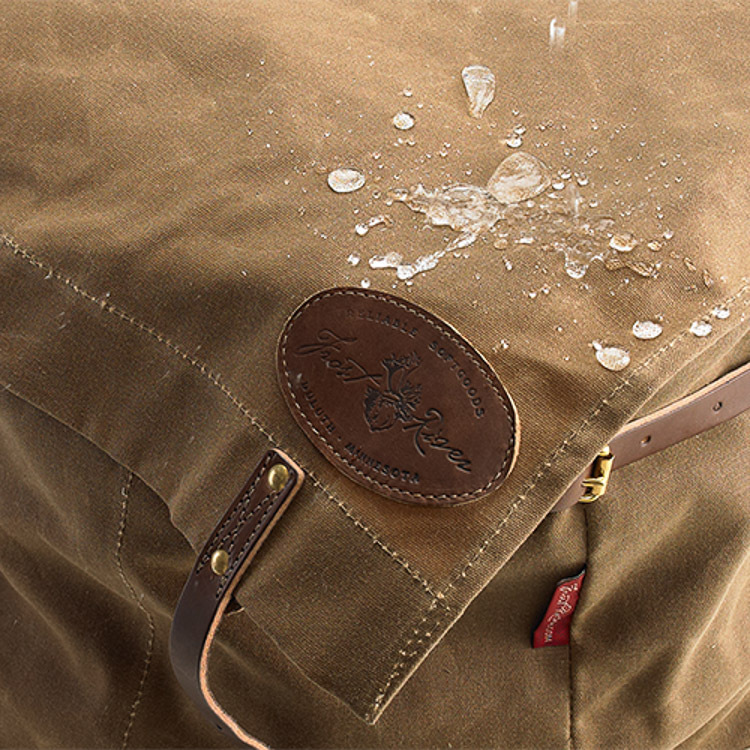 Our weather resistant waxed canvas has a proven reputation of performance over seven generations— it’s made to be outside. We pair this rugged, natural material with premium, full grain leather from the S.B. Foot Tannery in Red Wing, Minnesota. They’ve been making high quality leather and supplying Red Wing Shoes (the gold standard in work and outdoor boots) for more than a hundred years. Their leather is sturdy, trustworthy, and made by fellow Minnesotans. 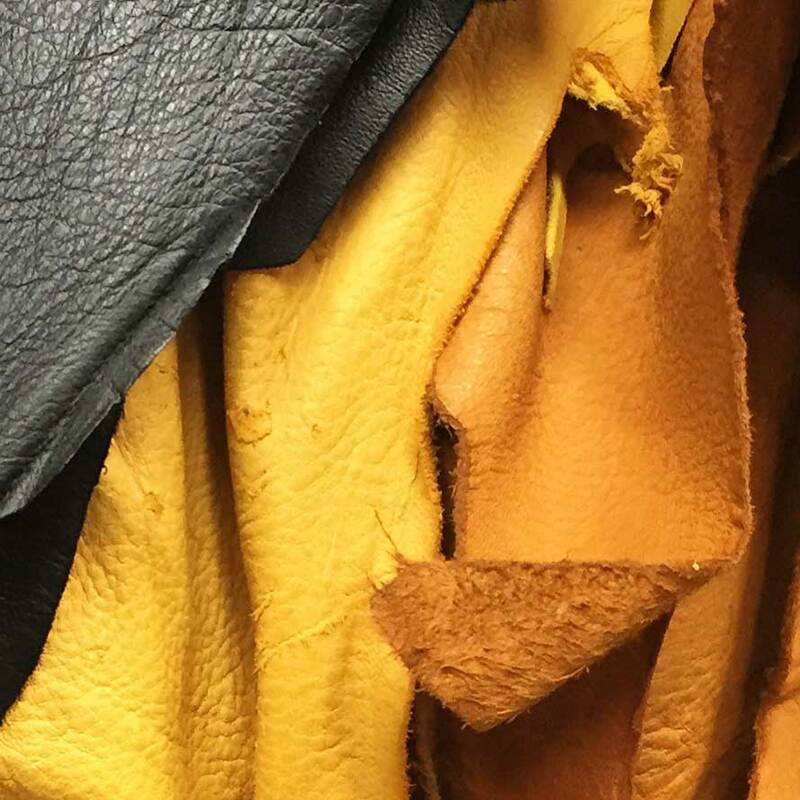 For our buckskin on shoulder straps, mittens, choppers, and Canvas My State Gear, we use locally-sourced, deerhide buckskin leather. It’s naturally water-resistant, supple from the start, and breaks in beautifully. A close examination of our leather will reveal natural textures, grain, scars, slight variances and blemishes that should not be seen as defects, but added character. We inspect each component throughout our production process, and carefully look over each product before we ship it out. Each bag is delivered to you with our assurance of quality and backed by our lifetime guarantee. Our buckskin padded shoulder straps really need to be felt to be believed. Heavy duty bridle leather and closed cell foam padding, wrapped in premium deerhide buckskin, they’re individual, one-of-a-kind, burly, and comfortable. Here are some tips to keep your bag running in top shape for a lifetime. Once you’re in from a trip, empty out your bag (and all your gear!) and let it dry out. Using a soft or medium bristle brush, remove any stuff that may have come back with you. Don’t use a metal brush, they’re too rough. An old tooth brush can help with the details. Use plain water, it works remarkably well on its own. Only use a small amount of non-detergent soap if the water and brush didn’t do the trick. 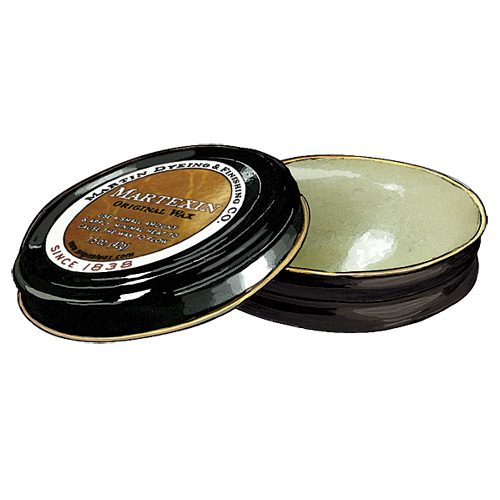 If you use soap or need to re-wax high wear or weathered areas, you can get a tin of the original formula here. Don’t forget about the inside of your pack, turn the whole thing inside-out and be sure the interior reinforcements are clean. Then let it all dry out, inside and out. Damp basements are a tough place for a canvas and leather bag to live. This environment breeds mold and mildew and you don’t want either of those around your pack. 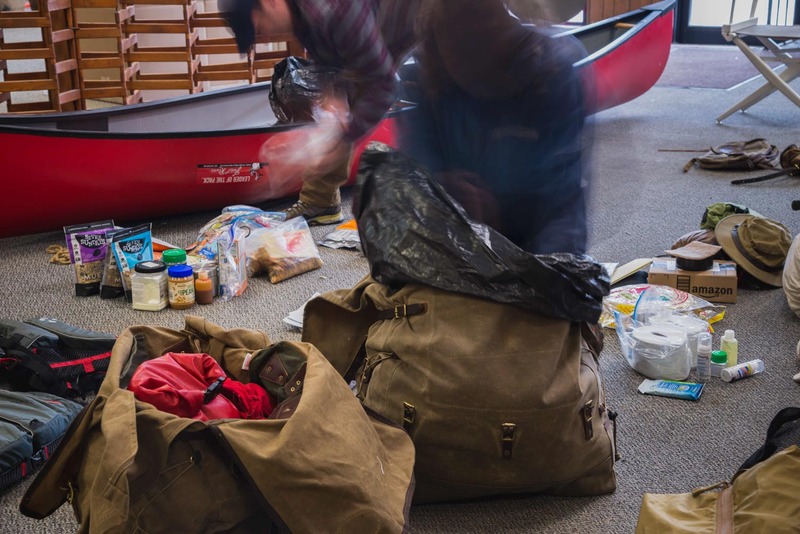 Don’t store your canoe pack or waxed canvas bag in your basement if it’s prone to those issues. Same goes for concrete, keep ‘em up off the garage floor. Hanging the packs or storing them on a shelf is a good way to keep your pack in good shape between excursions. Better yet, keep it partly loaded and ready to go! Heat guns, campfires, woodstoves, and even hair dryers are too aggressive for drying wet Frost River gear. They can cook and harden the leather… you don’t want that. Our waxed canvas and leather can take a substantial beating, come back looking fine, and last for years, so long as you treat them well (including not trying to dry them out too fast). We’ve had to repair bags that have suffered the wrath of too much heat. Please don’t do that to yours. Use a pack awhile and the leather will need to be conditioned. There are a lot of different products available and even more philosophies on what’s best. We say: don’t overdo it. Test small, inconspicuous areas first— less is best. All our straps, handles, trims, reinforcements, and odds and ends, are conditioned and good to go when they leave our shop; they’re treated at the tannery. Leather needs be cared for and the heavy duty stuff that we use takes a while to break in, but you’ll be happy once it does! Some conditioners will work better than others. Take care with load bearing straps so as not to over-treat and over-soften them. Shoe polish does well to condition leather without over softening like can happen with a big glob of mink oil. Several light coats are always better than saturating with lots of conditioner. Wipe off any excess and remember, less is best! We carry a leather cream that’s been working well. It restores, waterproofs, and protects with a nice blend of conditioning and polish. Plus, it’s made in the USA and comes in a handy portable tin! Be careful mixing our natural materials with fancy, light colored clothes. The dyes, wax, and conditioners in our bags could transfer to clothing in certain conditions like heat, sweat, water, and friction. Once your gear is broken in, it should no longer be an issue. It doesn’t happen often, just know it could. Frost River outdoor gear is tough. It’s guaranteed to last, and stand up to hard use outdoors, and, like anything worth keeping, it requires some care and cleaning to fulfill its potential and be with you for years of adventure… on and off the beaten path. Happy trails and good paddling to you, we thank you for the support! Bring packs outdoors, they’re gonna get dirty. If you carry a bag everyday it’s going to change (for the better). Waxed canvas has been used for many years without any washing or cleaning. But if you feel you must clean your bag there’s a right and wrong way to do it. Most important is not to overdo it. The Martexin Original Wax fabric we use is intended to be outdoors and is made to last. But it can’t be dry cleaned or washed in a machine. Those processes will strip the wax from the canvas. Just like you wouldn’t wash a pair of boots or a leather sofa, you shouldn’t wash your pack or bag. Lightly brush off dried mud and dirt with a brush. Start with plain water for cleaning. Hose it off, gently use a scrub brush, rinse, and let it dry. Less is more. For stubborn spots or stains a mild bar soap, flake soap, or saddle soap may help clean specific areas. Test a small area first. After several years, if you find the canvas drying out and wish to retreat it, you may re-wax your bag. We offer a wax conditioner right from Martexin, it’s their original formula and should be used sparingly. Warm up the canvas and the can of wax a little bit. Sunshine works, so does a hair dryer. Rub a little of the wax conditioner in, apply a little more heat so the wax sinks into the canvas then let it cool and dry. Repeat if necessary but don’t overdo it, a little is all you need. The canvas will develop a patina over time; use will bring out unique character and special qualities in the fabric that no other material could offer. Use your bag for years, it will look different (better) than when it was made. 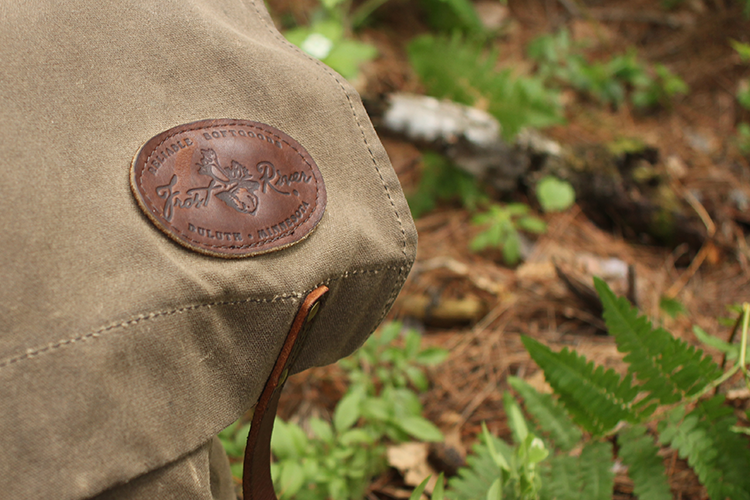 Our reliable softgoods are crafted from traditional materials that have lasted through ages, all are built to be used. The family behind Martexin Original Wax has been making canvas for seven generations. They know their stuff. Most importantly they say “DON’T baby your Martexin Original Wax, wear it often, it is weather-tough”. We couldn’t agree more. Paddling a wood canvas canoe on the Blackfoot River outside Missoula, Mt, with the waxed canvas Frost River Old No. 7 and Woodsman Canoe Packs and Four Piece Fly Rod Case.